CDM’s Lee Sherman has been roving through the massive CES tech show and Macworld Expo over the last two weeks. He files this report on how music (namely, guitar music) is making an impact on consumer gadgets. -Ed. 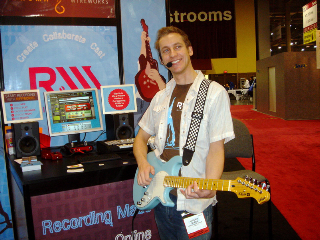 Guitarists are finally catching up to their keyboard-playing brethren in embracing digital technology due to a spate of recently introduced products, including the RiffWorks guitar jamming software (which includes online collaboration, shown below) and Gibson’s Digital Guitar. 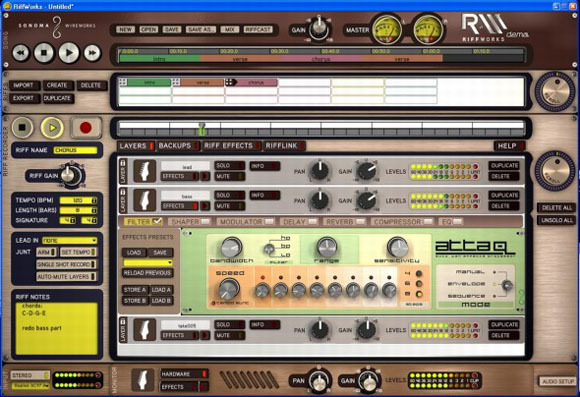 We’ve reported before on Sonoma Wirework’s RiffWorks, a brilliant piece of software that allows even technophobe guitarists to jam with their computers simply by strumming their guitar. 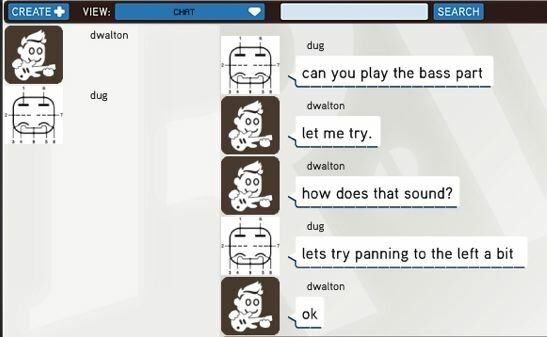 Version 2, demoed at CES (and Macworld), adds the ability to to collaborate with actual humans over the Internet in real-time or by recording into saved sessions stored on the server. These sessions can be published to a podcast, webcast, or a personal web page with a single click, complete with an embedded Creative Commons license. Personal web pages allow songs to be organized into albums along with album art and liner notes. The software will be available by the first quarter of 2006 for Windows XP and as a universal binary for Mac OS X on both PowerPC and Intel Macs. Pricing is yet to be determined. Electric guitars haven’t changed much since the 50’s when such new-fangled innovations as humbucking pickups and tune-o-matic bridges were first introduced. But Gibson is about to wake the electric guitar from its slumber with the introduction of the Gibson Digital Les Paul Guitar. In most respects, this is a conventional Les Paul, fitted with a special HEX pickup that sends signal to the MaGIC-enabled digital transport system. Guitarists needn’t worry that it won’t work with their collection of vintage stomp boxes and amplifiers. The difference is that audio can be sent in both directions over a standard Ethernet cable and signals can be processed on a per-string basis. Guitarists can adjust the volume, pan, and equalization of each individual string, applying different amplification and effects settings for each. That allows for some wicked chorus and reverb effects. The guitar includes a breakout box with eight Ã‚Â¼-inch jack outputs (one for each string), plus a classic humbucker and a pass-through for microphones. Two inputs can carry audio back to the guitar for monitoring while a split mode assigns strings to different amps. 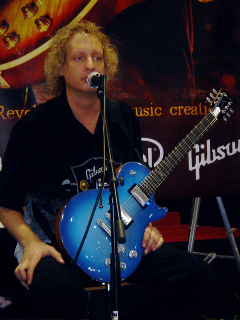 Gibson also claims to have eliminated noise and hum through the use of digital signal processing technology that occurs within the guitar itself.